The only crisis of capitalism is capitalism itself. Let's toss credit default swaps, bailouts, environmental externalities and, while we're at it, private ownership of production in the dustbin of history. 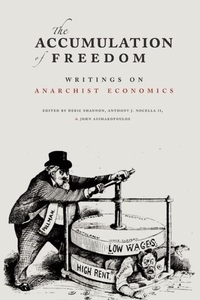 The Accumulation of Freedom brings together economists, historians, theorists, and activists for a first-of-its-kind study of anarchist economics. The editors aren't trying to subvert the notion of economics--they accept the standard definition, but reject the notion that capitalism or central planning are acceptable ways to organize economic life.